The underdog of my crisper drawer becomes a champion when roasted. Scanning through Trisha’s Table: My Feel-Good Favorites for a Balanced Life for a post we did a while back, I landed on Sausage and Peppers after skipping past the other recipes (at the time I had never had fried chicken, and I'm not entirely clear on what a chicken biscuit is). As instructed, I cut the peppers into bite-sized pieces, snacking as I went along, and layered them into a baking dish with quartered potatoes and spicy sausage. But I didn't fully realize their potential until they came out of the oven—as soon as I took one bite of the bell peppers, charred from a high oven temperature, and cooked for over an hour, I experienced something akin to what the nostalgic critic experienced in Ratatouille. 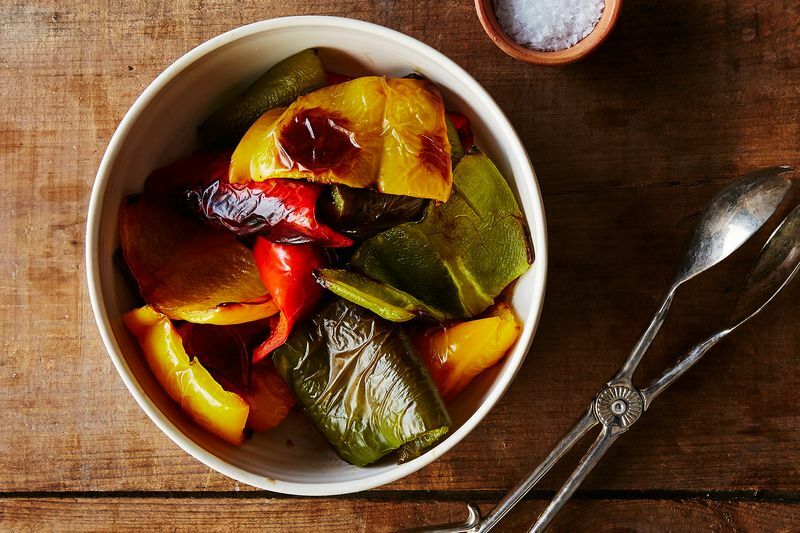 The caramelized peppers tasted sweeter than I could have imagined, and their slightly charred skin created a bitterness that meant that not only did I eat all of the peppers out of the dish, but I couldn't stop talking about them. (And here I'd been roasting broccoli every night.) Thus began, to my California boyfriend's delight, the Era of Fajitas. Whenever we're looking for an easy dinner, I suggest fajitas made with lightly toasted tortillas, forever-roasted bell peppers, pulled chicken, and sour cream—but it's all a front. I usually end up with a plate piled with just bell peppers topped with Jane's Krazy Mixed Up Salt (which is an obsession worthy of its own post). Bell peppers often contain unacceptable levels of pesticides and herbicides. Be sure to use organic chemical-free vegetables, especially when concentrating the flesh by roasting. You and I need to have a talk (read: date) about chicken biscuits. I always have Jane's Krazy Mixed Up Salt in the house - love it! Thin walled peppers grill well although one must be careful about the temperature of the grill. You can put down a piece of foil as a flame spreader to moderate the heat. I won't let the thin walled ones get completely charred. I've even done some of the small peppers like padrons and shishitos on the grill; these are always skewered (two parallel bamboo skewers about an inch or so apart so they don't spin around). I've had a hard time finding padrons in manhattan- maybe they're more widely available in SF? But I'll give them a try if I find them! Both padrons and shishitos are pretty easy to find in California. There are at least four stands at my town's farmers market that carry either, most of them carry both. When I am lazy, I pan fry them. Padrons are particularly easy to grow, almost as productive as peperoncini. You can get them at Spanish Table, about the only fresh produce they carry, but I don't know how widespread that chain is. In Spain they are generally eaten green, but they ripen marvelously. I think the red padrons and shishitos look great, I haven't seen any yet at farmers market this year, they've only been selling the green ones. I can't wait to get my hands on some of the red ones. Other thick walled peppers also roast (or grill or broil) very well- If you can find ripe Poblanos (I'm not sure the name Ancho is ever used except when they're dried), absolutely great. They're even better from the grill. They're always the first thing to go on mine when the mesquite is blazing hot and I cook them until the skin is completely charred (no color left, you can only see black). After peeling, I find they can easily last a week in an airtight glass container; sometimes I add some olive oil. They also freeze well. Of course, the charcoal from the grill contributes a slight smokiness. I only use hardwood lump charcoal (usually mesquite). The ones done over a gas stove burner or a gas grill are inferior to the ones from a wood-fired grill.